Myth 1: Only weak men suffer from depression. Men are just as vulnerable to depression as women. And while people may categorize men who suffer from the disease as weak, it is a psychological disorder that often cannot be avoided. 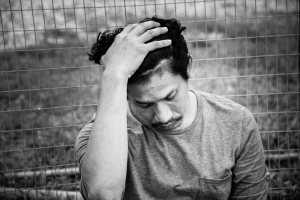 In general, men tend to mask their depression and lead to various self-destructive activities like alcohol and substance abuse, or even unprotected sexual sprees. While women tend to disclose their feelings to their friends, men would usually avoid conversations about what they are feeling. They usually avoid such instances where they talk about emotions because of pride, unease, or often not know that they need help. Myth 2: Real men don’t get depressed. Depression does not discriminate. And although more women suffer from depression, this does not discount the fact that there are men who hide their depression because of social discrimination and stigma. Depression never chooses its victims based on sexuality, intellect, or even occupation. People with a predisposition to the disorder can be hit by the disease at any time. Myth 3: It’s all in the mind. Although a man may not admit that he is suffering from the symptoms of depression and may not have a general idea that he is struggling with the disorder, it has to do with the wrong thinking pattern coupled with the feeling of despondency. Men would usually think it is all in the mind and will just go away. Depression is a disorder that needs attention much like other ailments. Myth 4: Depression is a choice. Nobody has ever wanted to be afflicted with the feeling of sadness and despair, so depression is never a choice. Regardless of your status in life, whether you are employed or not, in school or not, it can hit you anytime. Depression has something to do with your genetic and physiological composition – it’s not something that you cannot snap out or stop anytime you want. It is a disorder that needs to be fully addressed or can lead to life-threatening circumstances. Myth 5: Medication for depression can lead to prolonged addiction. Although psychological remedies for depression are often employed for non-chronic depression, they do not involve medication. Similarly, chronic depression can be treated by a combination of counseling and antidepressants, they are not addictive in any sense. Addiction only occurs when a person has the need for such substances at increasing levels so they maintain the “temporary high” feeling. Myth 6: Depression has no treatment. Depression is a general feeling of helplessness and despondency. Depression treatment can be achieved with the right counseling and proper psychiatric intervention. This method has been consistently effective in alleviating the continuing symptoms of depression. Also, a large number of people would usually respond accordingly to the right psychotherapy and medication. They can be combined with other safeguards against depression such as community involvement, improvements in sleeping and eating patterns, and increased physical activities. His House Rehab offers industry leading Depression Treatment Programs . We were founded in 1994 and we base our Drug and Alcohol Treatment programs on five key principles: commitment, honesty, integrity, respect, and service. These five principles guide us in all that we do and all the care we provide. Contact us today to see how we can help you or your loved one at (888) 681-4594.